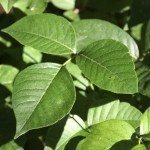 My garden's massively overgrown, so I've decided to poison it, but I would like to know if by spraying poison at the top of a weed is ok. Or, is it best to poison it at the base of the weed? It depends on the type of herbicide- some should be applied to leaves, others will be absorbed into the plant through the base/root. First, choose the right type of herbicide, then follow the label instructions. The label will tell you how to use it. Also, different herbicides are designed for broadleaf plants vs. grass, so choose an appropriate one for your situation.